COVERDALE, WILLIAM, carpenter and architect; b. in 1801 in England, son of Christopher Coverdale; m. Catherine Delmage and had five children; d. 28 Sept. 1865 at Kingston, Canada West. Little is known about William Coverdale before he came to Kingston in 1832 or 1833. According to family tradition his father was born in the shadow of York Minster and the family came to Lower Canada about 1810. The first two children of Catherine and William Coverdale were born at Île aux Noix, Lower Canada. The earliest mention of Coverdale in Kingston appears in the St George’s Church parish register, recording the birth of a son on 23 Sept. 1833. Kingston in the 1830s was attracting many persons in the building trades. In 1832 the rebuilding of Fort Henry was started and contracts were being let for the General Hospital; work began on the Provincial Penitentiary the next year using day labour. A master carpenter like Coverdale would find ready work. He became the “master builder” at the penitentiary when John Mills, who had been brought from Auburn, N.Y., was dismissed in June 1834. Hired at one-fifth less pay, Coverdale held the post 14 years and in that time the main building and gatehouse were slowly constructed, mostly with convict labour. 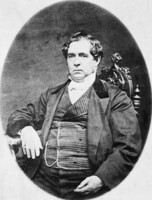 In 1848 a bill, introduced by Henry Smith, son of Warden Henry Smith of the penitentiary, passed parliament; the bill cut the architect’s salary and increased that of the warden. Coverdale resigned and, because of the constant difficulties he had experienced with the warden, refused reappointment when the salary was restored; Edward Horsey was appointed in his stead. In 1859 Coverdale also became the architect – the term he had used to describe himself after 1842 – for the asylum in Kingston and continued on this project to his death. The building he planned was erected mainly by convict labour and took over eight years to finish; the centre and the east wing were formally opened in March 1865. The penitentiary and asylum buildings, both still standing, mark the beginning and end of Coverdale’s work in Kingston. Between his activities on these two grim and massive works, he designed and built every manner of structure. The residences he planned ranged from workmen’s cottages to country mansions. Although his account book lists a few commissions in an area extending from Prescott to Port Hope and up to Perth, most of his work was in Kingston. In 1844 Coverdale took over the superintendence of the building of Kingston’s magnificent town hall from George Browne*. When the rear wing burned in 1865, he prepared plans for its rebuilding, carried out after his death by his son, William Miles Coverdale. The brewery, tannery, and bakery he designed are gone, but the Kingston churches still remain: St Paul’s, St James, and St John’s, all Anglican, and Sydenham Street Church, begun in 1851 for the Wesleyan Methodists, Coverdale’s own church affiliation. Only a few of Coverdale’s plans have been found and some are very like those in the builders’ manuals of the 1820s and 1830s which he had in his library. Although he built in a variety of styles, the Regency influence is strong in many of his buildings. Several of the best known houses in Kingston, such as Roselawn and the Mowat house, were planned by Coverdale, and other large Kingston residences built in the late 1830s, for which no architect has been identified, may also be his work. Anglican Church of Canada, Diocese of Ontario, Synod Archives (Kingston, Ont. ), St George’s parish register, September, October 1833. PAC, RG 11, ser.1, 38–41. QUA, Kingston Town Council, proceedings, 1844–45; Kingston City Council, proceedings, 1846–66; Portsmouth Village Council minutes, 1865; Queen’s records, D6, 17 Nov. 1848. Chronicle & Gazette (Kingston), 22 March 1844. Daily British Whig (Kingston), 5 April 1869. Daily News (Kingston), 14 Jan. 1852, 8 Sept. 1862, 29 Sept. 1865. U.C., House of Assembly, Journal, 1835, app.20. Margaret S. Angus, “COVERDALE, WILLIAM,” in Dictionary of Canadian Biography, vol. 9, University of Toronto/Université Laval, 2003–, accessed April 25, 2019, http://www.biographi.ca/en/bio/coverdale_william_9E.html.